Maureen Evans was drawn towards the stage while still in her childhood and had sung in several stage shows before beginning her recording career. This began as a session singer with the 'budget' label on which Woolworth's stores sold music, "Embassy". Although this label has been neglected by collectors- making it difficult to be sure that I have a complete listing of her output- all the recordings were well made covers of chart hits by a great variety of other artists. However, she later transferred to Embassy's sister label- the small 'independent' Oriole on which she cut more original material, including her famous hits. Maureen made many stage and TV appearances. Her style was always polished and professional but, despite her wonderful singing voice, she never quite broke through into the top flight of UK singing stars. During 1963, she hoped to sing the song "Pick The Petals" in the Eurovision song contest. Unfortunately the song was voted third in the qualifying heats and the prize went to Ronnie Carroll with "Say Wonderful Things" which ultimately came 4th in the contest. Although Maureen's output on singles was quite prolific, she has only this one EP credited her which is rather disappointing- though perhaps making its title rather apt. However, with the possible exception of the title track, Maureen's fans will find the songs it carries are not melancholic at all. Although she transferred to the CBS record label during the latter half of the 1960s, her chart prospects slowly faded and eventually she retired from foreground pop music. However, she never lost her love of show business and at the time of writing she could still be found teaching others in stagecraft at her drama school- based in her beloved home city, Cardiff. 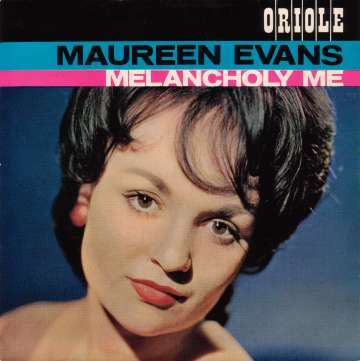 Oriole EP7076 1963 "Melancholy Me"